A rancher climbs a windmill to investigate why there is no water being pumped into this well. 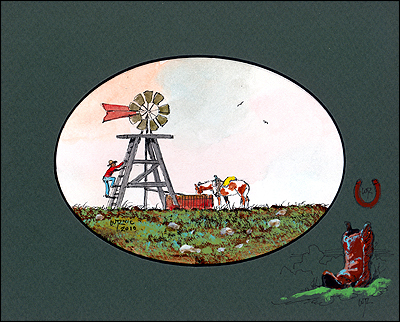 In the Old West, the development of the water-pumping windmill was the major factor in allowing the farming and ranching of vast areas of North America, which were otherwise devoid of readily accessible water. It`s ironic that this GREEN form of energy was used as far back as the 1880`s.